Equalizer bariatric cushion Height 3.5" Weight limit 500 lbs. 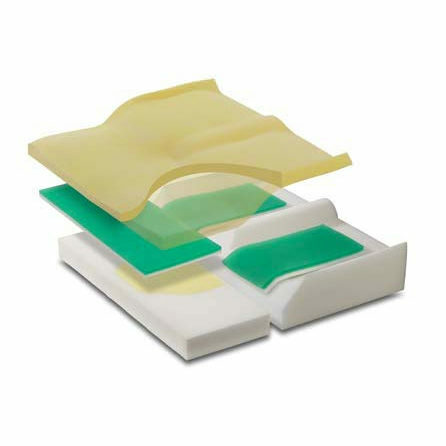 Span America equalizer bariatric cushion is multi-component constructed cushion features an ultra-comfortable viscoelastic "memory foam" top, a contoured foundation layer for proper positioning of the legs, and an extra-soft relief zone for highrisk bony prominences. Equalizer heavy-duty cushion has three zones of a proprietary, gel-like soft polymer which provide added pressure dispersion under the thighs, greater trochanters, and ischial/tailbone region. Equalizer bariatric cushion moisture-resistant cover has a rugged nylon bottom with a 2-way stretch fabric top and convenient front carry handle. Manufacturer warrants to the original purchaser that this products components, software, and cover will be free from defects in materials and workmanship for a period of 18 Months from the date of purchase, when maintained according to manufacturer specifications, using manufacturer provided equipment and maintenance schedule. The manufacturer makes no warranty with respect to PressureGuard products or their components that have been subjected to misuse, abuse, neglect, accident or unauthorized modification.